From a doctor Oliver Sacks has called a "born storyteller", a riveting account of practicing medicine at a fast-paced urban hospital. i really enjoyed listening to the story. it is amazing that you can hate a character but love her patient's stories. The stories told were unbelievably raw and haunting. The book is masterfully crafted and I am glad I took the time to finish it. However, if I had known what would be required emotionally before I started listening, I would chosen something else. Sensitive readers take note. What disappointed you about Medicine in Translation? I enjoy reading books on medical issues primarily for the 'technology', but I suppose it's my own fault for not reading the teaser before buying the book. 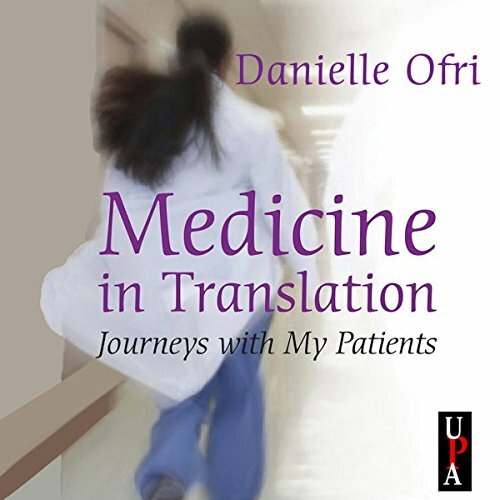 Danielle Ofri's book has precious little to do with medicine, and is, for all intents and purposes, a personal journal, primarily concentrating mostly on language and culture, with the barest minimum of medicine as part of the content. The book consists largely of the interactions with her patients, who are most often foreign, non-English speaking, and culturally apart from her own experience... with a thinnest amount of actual medical content. A social worker would probably have just as much to say, and possibly more, without the pretense of medicine in the book title. What was most disappointing about Danielle Ofri’s story? Dr. Ofri is apparently a frustrated amateur novelist (she described one motivation for moving her family to Costa Rica, for a year, as a chance to work on a novel). The prose is lyrical, like a novel... but the substance is most often banal. Dr. Ofri, I'm sorry to say, comes across more as a self-possessed over-achiever, attempting to elevate her personal experiences above their natural level of 'ordinary' to something more than that. Her story impressed me as a person a bit too eager to experience a full life, fuller than would satisfy most people, and probably still not full enough to satisfy even Dr. Ofri. I found the attitude perhaps a bit off-putting. What three words best describe Beth Richmond’s performance? The narrator did a workmanlike job, considering the banality of the material. What character would you cut from Medicine in Translation? Actually, a character needed to be added: Dr. Ofri's husband, who she referred to in only rare occasions, and more as an object than a partner. Consider the rather substantial decision to uproot her family and move to Costa Rica, it might have been nice to understand HIS reasons for doing so; Dr. Ofri offers only her own. By this review, I don't mean to disparage Dr. Ofri; she is obviously a talented woman and a committed MD... it's just that her journal seems more of a vanity project, than a treatise with something significant to say.